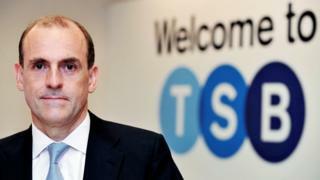 TSB chief Paul Pester is to step down after seven years in charge, in the wake of a major IT failure at the bank. In April this year, customers were left without access to online banking services for several weeks when an attempt to move data to a new computer system went wrong. The bank is still struggling to get its IT systems to work properly. On Monday, it apologised to customers who faced disruption to their online and mobile banking over the weekend. Following Mr Pester's departure, TSB chairman Richard Meddings will take on the role of executive chairman until a new chief executive is appointed. Mr Meddings said: "Although there is more to do to achieve full stability for customers, the bank's IT systems and services are much improved since the IT migration. Paul and the Board have therefore agreed that this is the right time to appoint a new CEO for TSB." Nicky Morgan, chair of the Treasury Committee, said she felt Mr Pester's decision was the correct one. "Since the IT problems at TSB began, Paul Pester set the tone for TSB's complacent and misleading public communications," she said. "In this light, it is right that he is stepping down, but the committee remains concerned about the continuing problems at TSB, including unacceptable delays in compensating customers who have been badly let down." Mr Pester walks away with a payout worth nearly £1.7m, made up of £1.2m severance pay and a "historical" bonus of around £480,000 from before TSB's takeover by Sabadell in 2015. All other performance-related pay - including a bonus linked to the customer migration - was frozen amid investigations into the IT fiasco. After April's IT meltdown at TSB, many people thought Paul Pester was a dead man walking. Although he toughed it out after that - he'd used all of his nine lives. Problems flared up briefly in August and more problems over the last 24 hours drove the final nail into the coffin. Some will feel that he was a victim of circumstances beyond his control. The new system was built, designed and tested on the watch of Sabadell, TSB's Spanish owners who were convinced the system was ready. However, IBM - who were drafted in to help with the crisis - said in a report that the system had not been tested sufficiently, and Mr Pester himself came across as complacent to many MPs. The IT debacle cost TSB £176m and 26,000 customers closed their accounts (although 20,000 new accounts were opened offsetting some of the damage). The bank and Mr Pester's reputation took a heavy knock. Ultimately the buck stops with the chief executive and on Tuesday morning he paid the perhaps inevitable personal price. Paul Pester joined Lloyds Banking Group in 2010 and was appointed to lead the launch of TSB and its separation from Lloyds in 2011. TSB was launched in 2013 and was floated off in 2014 before being bought by Spanish bank Sabadell in 2015. Part of the transfer involved migrating customer records from the Lloyds Banking Group platform to the Sabadell Proteo platform which started on 20 April 2018. That proved a disaster with many customers being locked out of their accounts and some customers being given access to the confidential records of others. The problems continued for many weeks and TSB came under fierce criticism for the IT failings. MPs on the Treasury Committee called on Mr Pester to resign. But he remained in his post, and said: "I'm focused 100% on putting things right for our customers." In June, the Financial Conduct Authority launched a formal investigation into the meltdown. Its chief executive, Andrew Bailey, took the unusual step of making the probe public, "given the level of public interest". In July, TSB said the IT meltdown had cost £176.4m and pushed it to a half-year loss. Being unable to get access to their TSB account at the height of the computer crisis earlier this year left many customers with big problems. Lorna McHale's marriage to Ben Connolly in May was hit as the couple had their wedding savings in a TSB account they couldn't access. She said she had to "ring to grovel" with suppliers for their wedding, including the DJ, the wedding car provider, and those doing her hair and make-up, all of which were small businesses. Their case was raised by MPs grilling TSB chiefs during a Treasury Committee hearing. The good news is that the wedding day went well despite the financial stress beforehand. In fact TSB called her the day before the big event to apologise and offer her £100 compensation for all the distress the bank had caused. Lorna accepted the offer despite feeling it was a little low. She said: "They told me they'd read my story on the BBC and so knew it was the day before my wedding. I felt they took advantage of my stressed situation to offer low compensation." She said she's now planning to switch banks.